on global Christianity and "transformative mission" from SPU's Day of Common Learning: Visit spu.edu/itunes to download podcasts and view videos of presentations by SPU faculty, staff, and students. Guest speaker Lisa Slavovsky, aftercare specialist for International Justice Mission, discussed ways to seek, do, and see justice as plenary speaker for the 2015 Day of Common Learning. That’s what Margaret Diddams, SPU’s assistant provost and professor of industrial and organizational psychology, asked the Seattle Pacific community in a late-afternoon email on October 21. The occasion? SPU’s 14th annual Day of Common Learning. Diddams encouraged readers to post their responses and include the hashtag #SPUDCL. And yet, even before her prompt, so many students, staff, faculty, and campus visitors had spread the word online about what they were learning that, she pointed out, #SPUDCL became a “trending topic” for Seattle on Twitter. Lisa Slavovsky, aftercare specialist for International Justice Mission, delivered the keynote address, titled “Who Is My Neighbor?” IJM is an organization that protects the world’s poor from slavery and other forms of violence. Slavovsky worked for six years supporting and leading a team of Cambodian social workers to provide aftercare services for over 350 women and children removed from commercial sexual exploitation. She currently assists IJM’s global teams in designing and implementing effective models of service for child trafficking survivors, helping survivors safely return to their communities, and equipping local social service experts to work for sustainable rehabilitation. 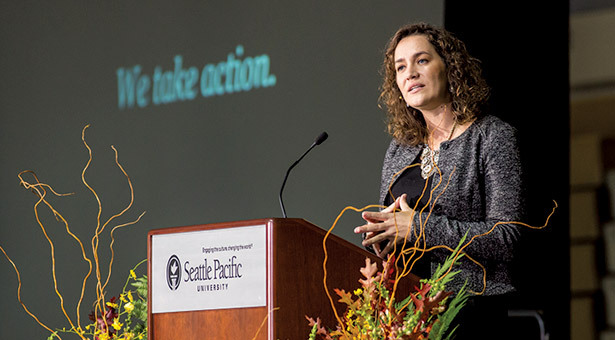 Everyone should cultivate compassion for enslaved and impoverished people around the world, Slavovsky told the SPU community, gathered in a packed Royal Brougham Pavilion. She discussed the story of the Good Samaritan, highlighting ways that story parallels the challenges of fighting global injustice today in a world where it is easy to ignore or sidestep. Slavovsky’s opening was the prelude to an afternoon of public lectures and presentations by students, faculty, staff, and guests. Subjects included poverty alleviation in the United Nations’ 2030 Agenda for Sustainable Development; preparing women to enter fields in which women have been underrepresented; the role of libraries in promoting justice through free information; and how a sacramental view of food can enhance the environment and human well-being. Some presenters focused on the pursuit of justice through the creative exercise of technology, design, and the arts. SPU faculty explored theological and scientific perspectives on God’s call to treat the environment justly. In one session, chaplains with the King County Juvenile Detention Center spoke about imagining alternatives to mass incarceration. Other sessions explored issues of justice and reconciliation in the Holy Land, and pursuing justice in and for Asian American communities. Read Response’s Q&A with Lisa Slavovsky of International Justice Mission.